After a successful Cross Country season in the USA, I got the opportunity to represent Switzerland at the European Championships. Competing in the US for the past years, this was my first chance in a long time, to prove my good shape on the biggest European Distance Running stage. After a decent start, I turned in the middle of the field into the first corner, which was way too close for 90 athletes and the tree in the middle of the course made it even more intense. My plan was it to pace my first few laps controlled so I would be able to progress. But already after two laps, my legs didn't feel quite as good as in past races. Still five laps to go, I realized that I am already way closer to my limit as I planned to be. Which followed, that this great opportunity of competing with Europeans best turned out to become a solo run in the back part of the field. I finished the race in 82nd position, losing over 3:45 and missed my goal to finish in the first half by quite a bit. To accept a result like that takes a while, but I know, I had a really good season up to that race. 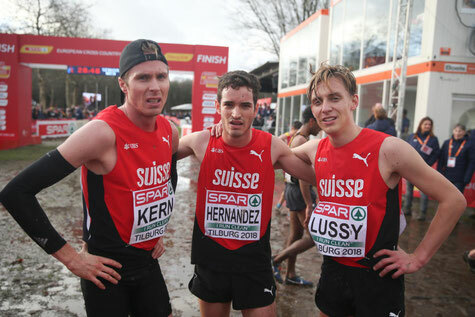 While most of the European athletes raced three to four times, I competed in seven cross country races in three months. Since this was my first full cross country season in the US, it was hard for me to judge, how the whole season would impact my racing. Getting closer to the European Championships, I was aware that I was not fully recovered, but I was convinced that I will represent my country well. Looking at the result, this was surely too optimistic. Looking at the whole season, I definitely made a big step forward, but the last two races also showed that it is still a long way to the top. I am really motivated to step up the work to get there and wished to start right today. But first, I will take a few days off to be fully recovered for the preparation of the upcoming Indoor season with UNT.